Preparing for a road trip to the desert is a little different than going to the mountains or to the city. The desert is REALLY HOT this time of year and you’ll not only want to prepare yourself for the trip, but you need to prepare your car too. You’ll want to make sure the car is running properly, all the fluids are checked and the tires are good. Can you imagine breaking down or getting a flat tire in 112 degrees, in the middle of nowhere??? I’ve lived in the desert before and I have seen more than my share of poor souls stuck on the side of the road in miserable heat. We decided to take a short trip to Palm Springs right after school got out. My husband usually tends to all the car care, but this time I happened to be involved. The first step was the check the tires and get an oil change. Our time was very limited, so we decided to go to the Walmart Automotive Care Center so we could get some shopping done while we waited. I also knew that Walmart has Rollback pricing from June 10th – September 9th on Pennzoil Oil changes. 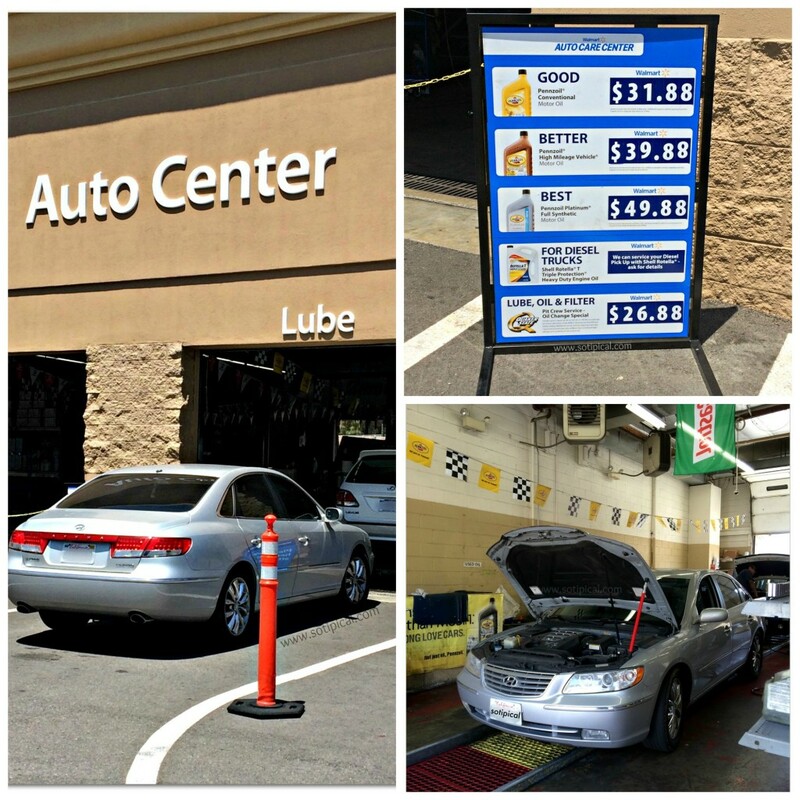 The High Mileage oil change is only $35.88 and the Platinum Full Synthetic oil change is only $45.88. I am not usually involved with car maintenance because I have a hard time sitting and waiting for the service to be completed. I feel like I need to be doing something more productive. Now that I realize I can pick up groceries while I get the oil changed, I am more than willing to take the car in next time! Our car has high mileage (135K mi), so we opted for the Pennzoil High Mileage oil change because this oil helps to reduce oil consumption and minimize leaks for high mileage engines. It is also designed for later model vehicles with over 75K miles, to help keep the engine running clean and going strong. The service technician was very nice and very helpful. While we waited, we popped into the store and did some shopping for our “Road Trip Survival Kits”. Now each of has a different idea of what our “Road Trip Survival Kits” should look like. Dad: Charge cords, ear buds, iPad, water, hat, sunglasses, sunscreen, swimsuit, rash guard and a couple of changes of clothes. 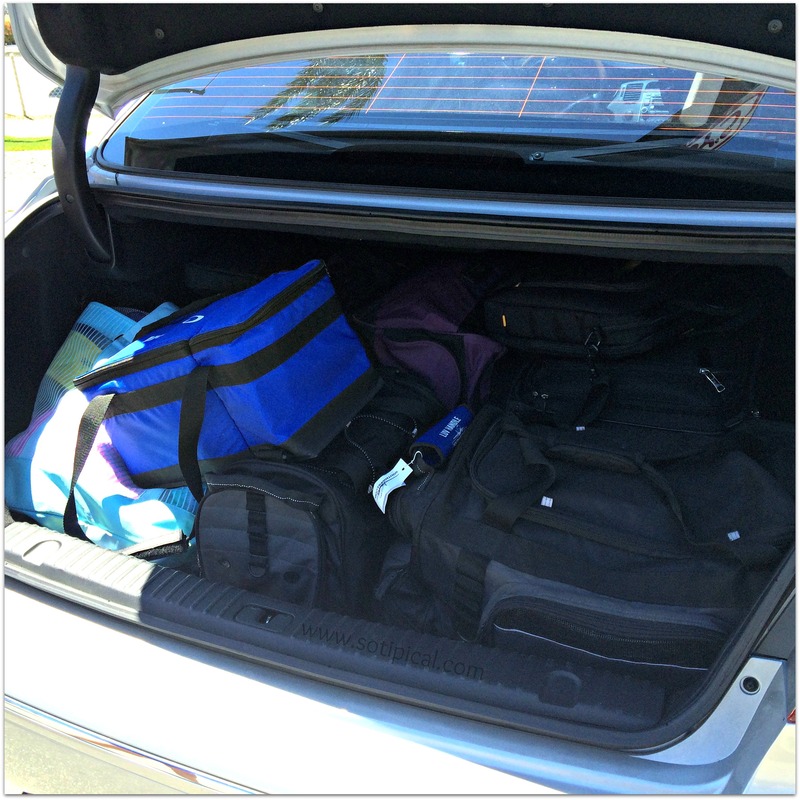 I’m not sure we needed sun screen and goggles in the car….but they were packed! They also packed me two magazines! Then there were multiple outfits, multiple swimsuits, multiple shoes, hair tools & accessories, books, pool toys, and much more. Mom: My list had everything else! Besides my clothes, shoes and toiletries, I also pack food, drinks, various allergy meds, first aid items, paper towels, various sizes of plastic zip bags, lots of sunscreen, aloe gel, pool bag, sun glasses for myself and the kids, extra hats, cover ups, and a book for me. I say “lots of sunscreen” because when you’re in the desert, and you’re in the pool, you need to constantly reapply sunscreen or you will burn. And by constantly, I mean every 1-2 hours. Waterproof or not, it will wear off! I also plan out various stops along the way to make the long ride more fun. The car was packed full and off we went! Since we were heading to Palm Springs, my first order of business was figure out where we would stop for a late breakfast, conveniently close to the big outlet mall… We had breakfast at a really nice Ruby’s Diner in Cabazon, Ca, which is just down the road from the Cabazon Outlets… Right after we ate, we headed to “Mom’s Real Vacation Before the Vacation” and shopped for a couple of hours. Sadly, I struck out this time, but my girls scored! They got some really cute clothes and I spent very little. There were some great sales that day! 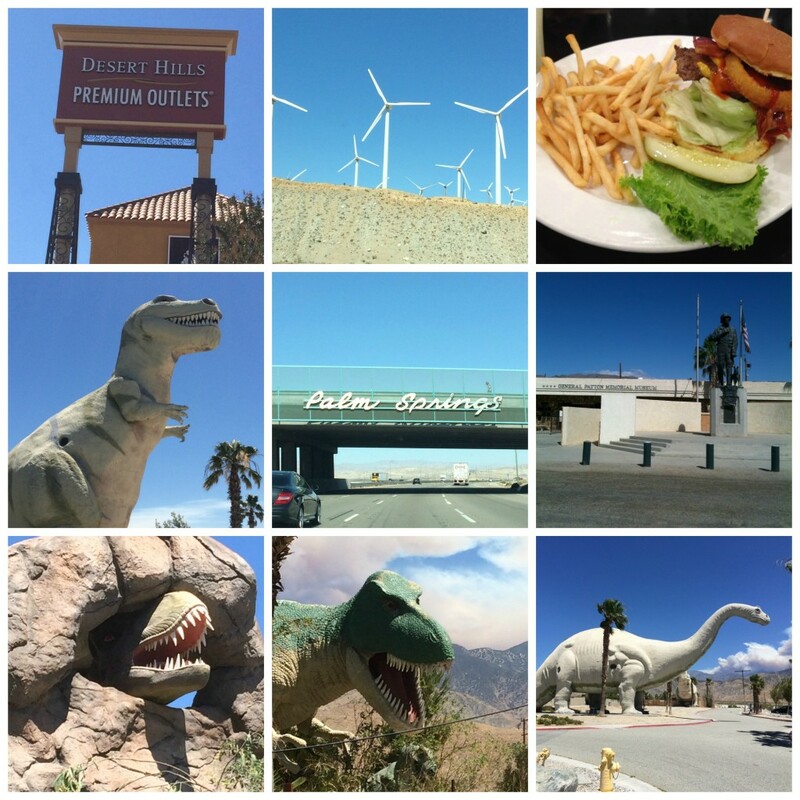 Next stop was the Cabazon Dinosaurs! It was fun to walk around and see the giant dinosaurs. Your kids will love it! The other attraction was the General Patton Museum. We didn’t go inside this time, but my husband and kids have visited before and they enjoyed it. Lastly, we stopped and checked out the famous windmills in the area. They were SO HUGE! It was pretty hot out or we would have visited the Joshua Tree Monument. We’ll do that another time when its not so hot! Once we arrived at our hotel, we spent nearly every moment at the pool. Aside from it being 114 degrees, (no, that isn’t a typo), it was just so relaxing and we just wanted to enjoy life at a slower pace. The kids not only got me in the pool everyday, but down the water slide too! Don’t neglect your car. Take care of it like you take care of yourself! After all, your safety relies on it! Don’t over-pack! We all packed 6-8 changes of clothes for 4 days. We used like 2 outfits each and wore swimsuits the rest of the time. Huge waste of time packing and space in the car! Don’t pack a ton of food to bring with you. It was more hassle than it was worth. Just bring enough for the car ride and plenty of ice blocks to keep the food and drinks cold. When you arrive, do your shopping locally. Unplug and enjoy your family time! I had more time to sit back and really see how much my kids have grown this past year. It made me realize we need to spend more quality time, more often. How do you plan for a road trip? I would love for you to share your tips in the comments! I used to go on a lot of road trips from college to home… 8 hours – I am a pro roadtripper! And now… I want a pickle thanks to that photo of the burger w/ pickle! ha ha ha ha! I love the tips here and your road trip looked fun! I’d love to go visit dinosaurs!! We haven’t road tripped to the dessert in awhile. We’ve been sticking to the mountains, but we always bring the books and other goodies for the kids in the car. Looks like you had a fun trip! Such great tips! My boys would love seeing those dinosaurs! Have never been to the dessert. Looks like you had a great time. Thanks, for the great tips. What fun! Great tips too. Its so true!!! Gotta take care of that care before traveling.. I actually just did the same last week. We also usually opt to stay somewhere w/ a full kitchen that we can stock. Sometimes we will pack up 1 cooler and I’ll have frozen marinated foods in there to get us through our week and we buy everything else local to where we stay. And bringing the kids kindles and ear buds is crutial! You should plan one! Isn’t it great to be productive while the oil is being changed? I can’t believe I haven’t tried this before! I absolutely love road trips. Can’t wait for my daughter to be a bit older to enjoy them. This looks like a great road trip! We need to plan more, but being prepared is essential. What an amazing road trip! Lucian would love seeing those ginormous dinosaurs! 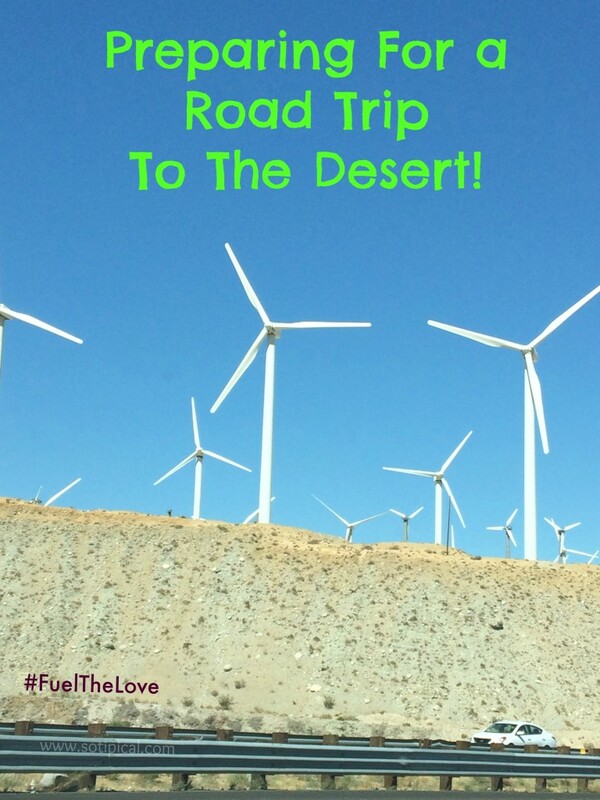 I haven’t done a road trip in the dessert since 2009, and I’m jealous you just did it! Looks like a great trip!